Please note: The following text and photos are modifications that I have made to my own 1998 Toyota Tacoma. This article is not intended to suggest that anyone else should add this modification to any vehicle, nor is it intended to be comprehensive instruction. The owner of this website, and it's contributors and editors cannot be held responsible for any damage done to any persons or property due to modifications as shown herein. If you wish to perform or install such modifications as illustrated on this website, you must do so at your own risk. Credit must be given to Mark Griese of AZTTORA for this modification. He was aware of a notorious problem with the rear shocks when modifying the suspension on the Tacoma and decided to come up with a solution. 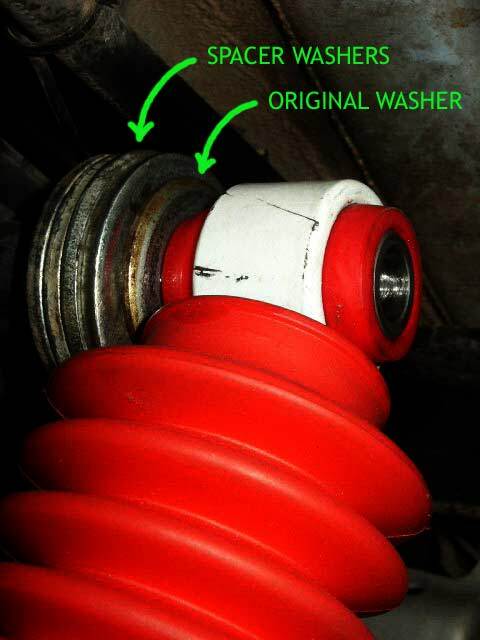 The problem arises when a suspension lift is added to the rear, thereby allowing the rear axle to articulate more. If the shocks are attached to the stock mounting locations, the side of the leaf packs will actually contact the shocks when a great deal of spring flexing occurs. This eventually results in a "dented shock can" whereby the shock body is damaged from the impact of the leaf springs. The drill bushings and bolts can be ordered from McMaster-Carr (562) 692-5911. Drill bushing, part # 8491 A442 and Hex head cap screw, part # 91180 A718. The flat washers can be purchased at a local hardware store. Try to pick out washers that have the same approximate thickness, as they may vary. The drill bushings are pictured at the left. 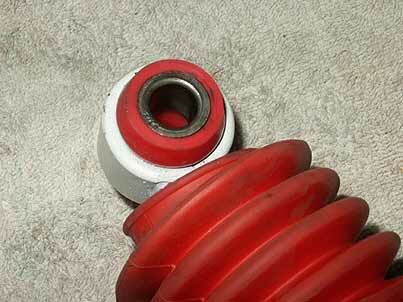 The drill bushings are to be installed inside the shock bushings (one drill bushing per each shock bushing). They act as a spacer. Four of the 3/4" I.D. flat washers are placed on each shock mount, followed by the original (factory) shock washer. These washers will act as a spacer to place the shock further away from the leaf pack. As the shock is spaced further from the original location, a gap is created between the end of the shock stud and the face of the bushing. This gap is filled using the drill bushing. The longer metric bolts are then installed (using the outer shock washer) through the drill bushing and shock bushing, and threaded into the shock stud. 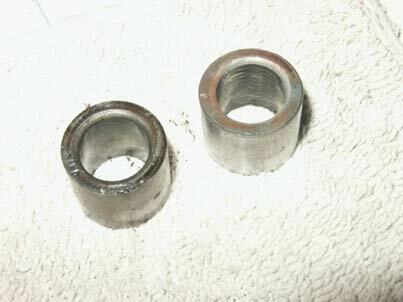 A bit of Loc-Tite thread sealant may be added to ensure that the bolts stay tight. Here is the left side completed. 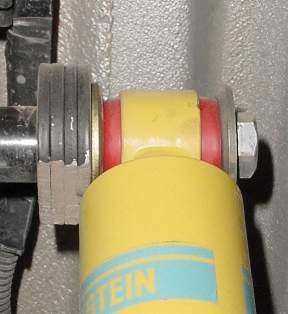 It is easy to see the additional clearance provided by the spacer modification (click for larger pic). 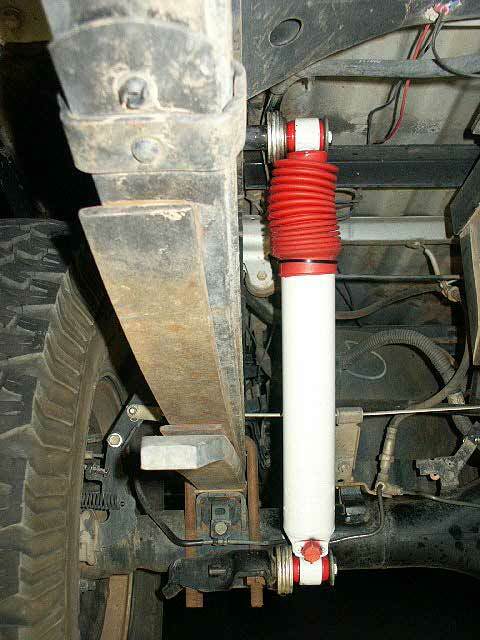 Since installing the shocks in this manner, I have been on countless trails testing the suspension to its limits. I am happy to say that dented shocks have become a thing of the past.